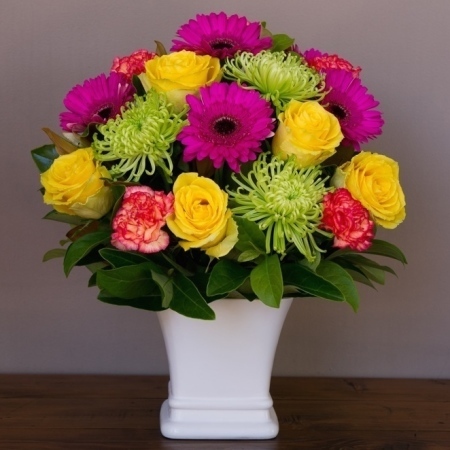 This wonderful selection of cheerful bright flowers is sure to be a winner .Pleasing to the eye this stunning combination is sure to bring joy to the recipient on their birthday. Included in this gorgeous arrangement are hot pink gerberas and yellow roses that are wonderfully arranged into a handy ceramic pot. Call us on 02 9871 1666 to talk to one of our qualified florists. To help make your purchase unique add one of our extra gift items.